I like pink, but I just don’t have a lot of it in my house because I lean towards the reds and corals instead. 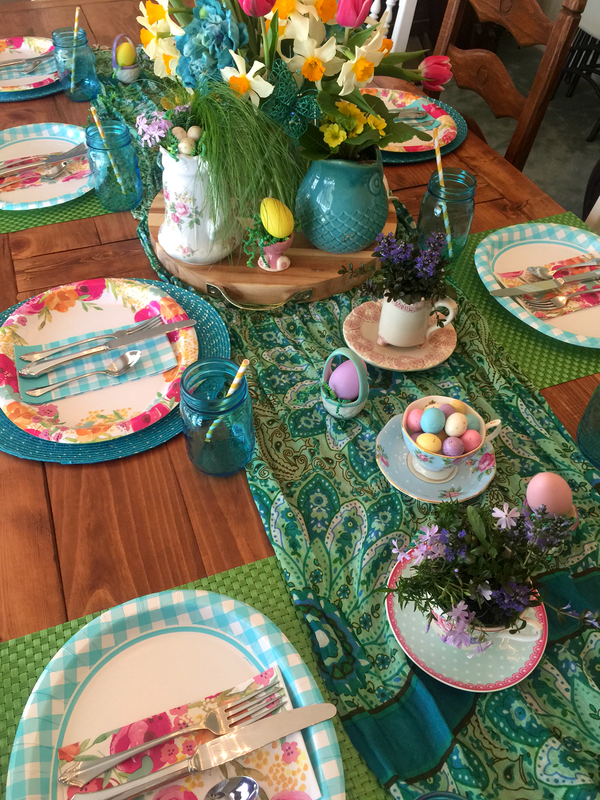 So when I was trying to come up with some pretty table decor for Easter, well, I was a bit stumped at my lack of pastel decor…until I remembered my obsession with aqua. 😉 And then it just all came together pretty quickly! My husband had so sweetly come home with a bouquet of hot pink tulips on the first day of spring, so of course I had to include those, along with some daffodils from our yard. (Yay for sweet husband, flowers, AND spring!) The aqua additions in the bouquet are faux flowers and a sparkly butterfly that I used from a previous event. And I don’t have a lot of different china patterns, so I’m gonna be honest here…for special events, I often get super cute paper plate and napkin sets. (You can totally recycle those paper plates, too – just scrape the food scraps off afterwards and toss them in your blue bin.) 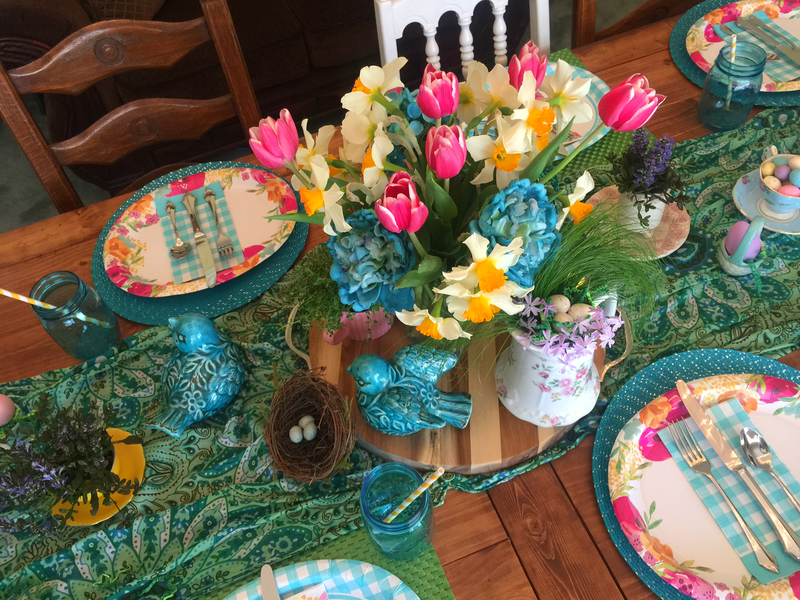 These two sets came from Wal-mart and I love, love how much fresh color they bring to the table, especially when you alternate them and switch up the napkins. To add something special, you can totally put paper plates on placemats for extra layering and texture. 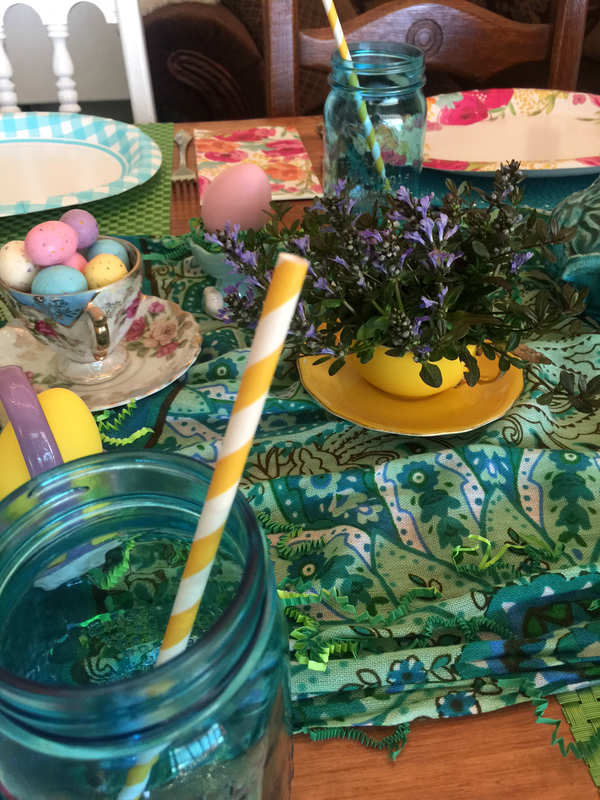 The addition of real silverware, my blue Mason jars to drink from, and yellow striped paper straws also give this casual table more substance. The best part of springtime, in my opinion, is that the world comes back to life again! After a winter of leafless branches, brown grass, and a sad-looking landscape, it always makes my heart happy to see those cheerful yellow daffodils popping up beside the pinks and purples of hyacinths and phlox. I have a feeling that our spring season is full of sweet reminders from God that life comes after death. We’re reminded that we die to sin when we choose to submit to Him and obey the gospel. We’re called to a complete rebirth in Him – an abundant, beautiful, brand new life, full of spiritual fruit that we start to bear as we learn to follow Jesus’ example. It’s a gorgeous and meaningful analogy – and I thought it was so very appropriate to include some live plants in this tablescape. 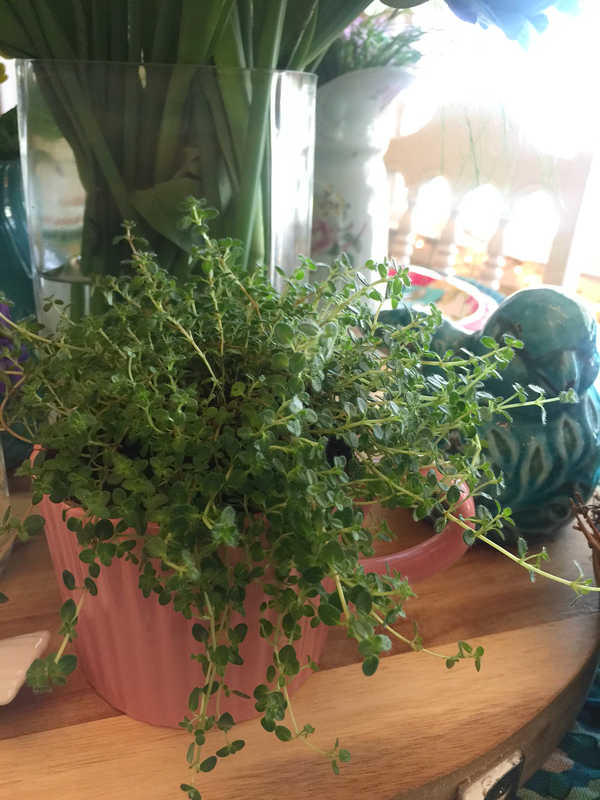 I’m loving this yellow primrose in my aqua owl planter! What’s Easter without some eggs? These are simple malted eggs – they were a great size and speckled just right. 😉 They look super cute in a couple of my teacups. I totally love this Royal Albert New Country Roses Polka Blue teacup that my sisters-in-law and mother in law brought back from a tea shop in Canada! I bought the decorative grass from a nursery and then added a bit of phlox and a bit of paper Easter grass (from Walmart) for a few little eggs to nestle in. 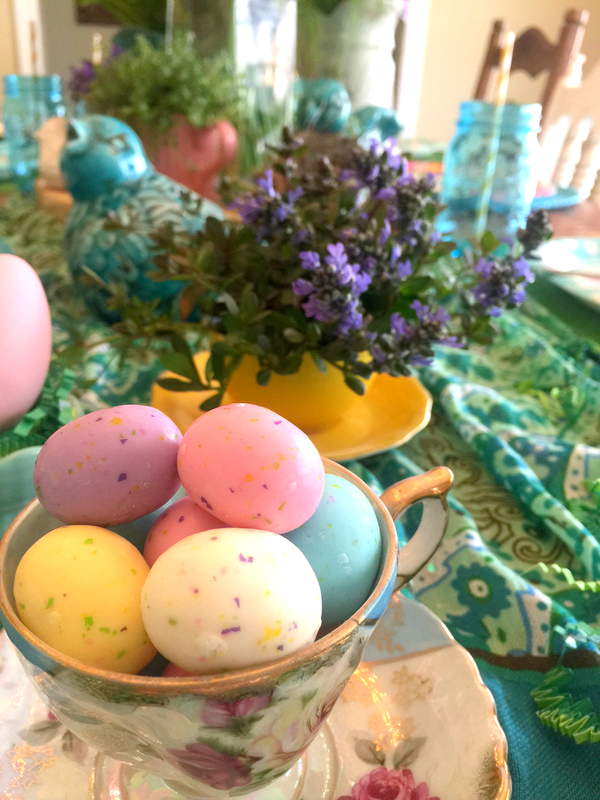 I didn’t dye Easter eggs – those bigger eggs are actually faux chalkboard eggs! (again – Walmart) But I didn’t have time to draw designs on them. But I actually thought it would be a cute idea for each guest to design an egg. 😉 The egg cups are from Wal-mart also. 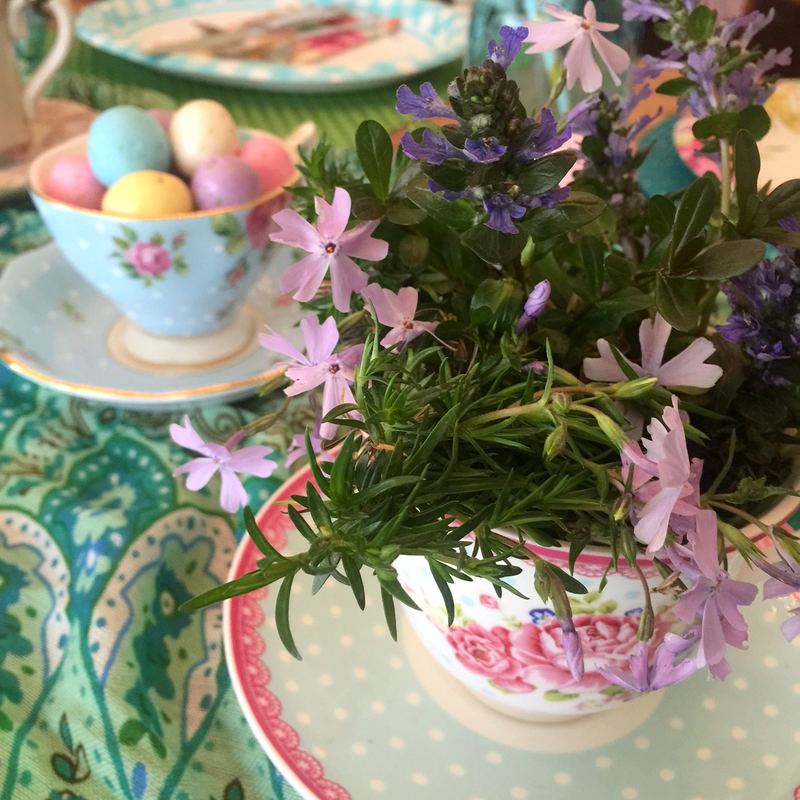 Perfectly set for a lovely Easter dinner – or springtime tea party! =) Speaking of food, our new Mango Alyssa has a lovely Fresh Strawberry Yogurt Cake recipe to use for Easter or any springtime get-together! Check it out! This post contains affiliate links, which means I would earn a small commission if any purchases were made through those links. Thanks for keeping The Ruffled Mango running smoothly – we so appreciate your support! Want to save these ideas for later? Pin this post! Want to share these ideas with creative friends? Share this post on Facebook! Holly from McCall Manor has a cute porch redo just in time for warmer weather! 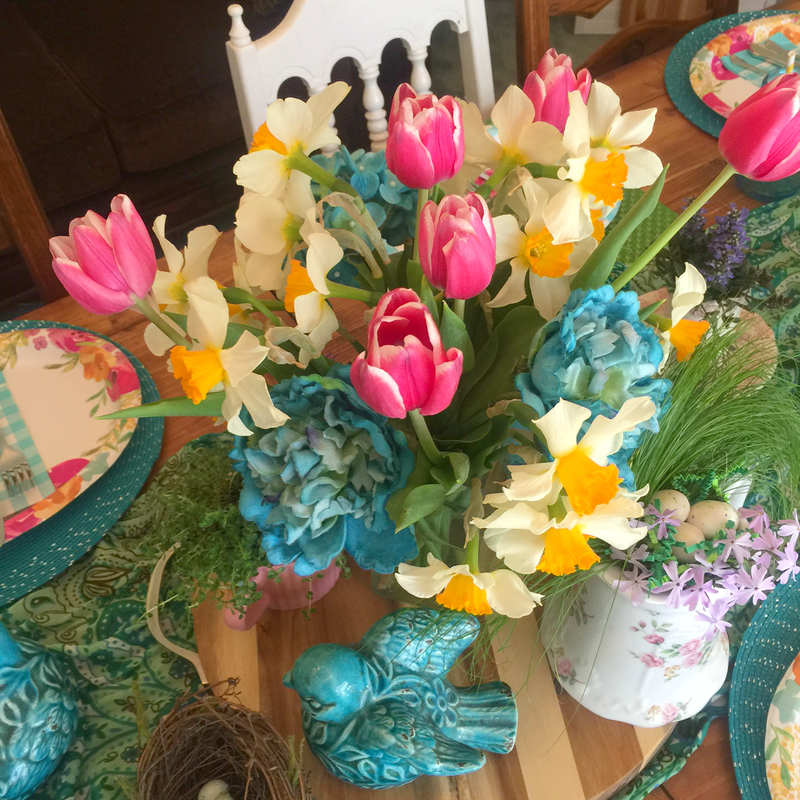 And Stacey from A Southern Discourse has some hacks for an adorable farmhouse spring wreath! LOVE the aqua and all the live plants and the tea cups!! Oh, so much to love!!! Thanks, Stacey!! Thank YOU for giving me the idea about using a scarf as a table runner! By the way, I was at a wedding reception last night where each table was accented with a colorful scarf! Perfect!